Terrible. That’s just about the only way you can describe Thursday’s release of the Philly Fed Manufacturing report. For a city that booed Santa Claus, we can’t imagine that people in the region are very happy with the latest report. While economists were expecting the headline print to come in at a level of 14.0, which would have been just a slight decline from last month’s reading of 17.0, the actual reading came in at negative 4.1. Yes, you read that correctly, negative 4.1. 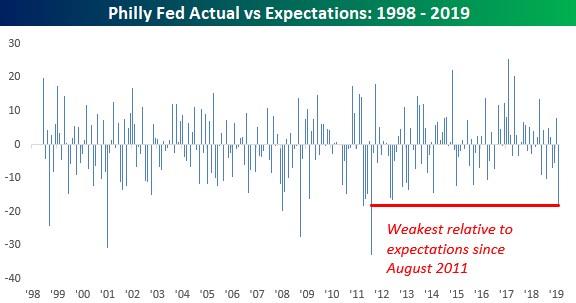 Not only did February’s reading end a streak of 32 straight months of positive readings, which was the longest streak since the late 1980s, but it was also the largest m/m decline and the biggest miss relative to expectations since August 2011. That’s pretty bad! But it gets even worse. The table below breaks down this month’s report by each of the report’s components. Even worse than the headline reading, which saw the largest m/m drop in nearly eight years, New Orders actually collapsed at the fastest rate since October 2008. It doesn’t get much worse than that! 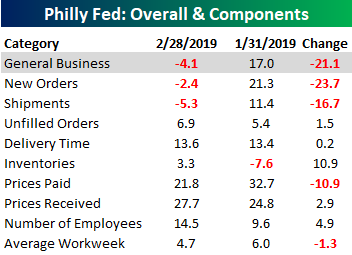 Shipments were also very weak falling from 11.4 down to negative 5.3 for its first negative reading since September 2016. Finally, inflation doesn’t seem to be a concern of manufacturers in the Philadelphia region these days. The table below shows the results of the special question asked in this month’s survey. 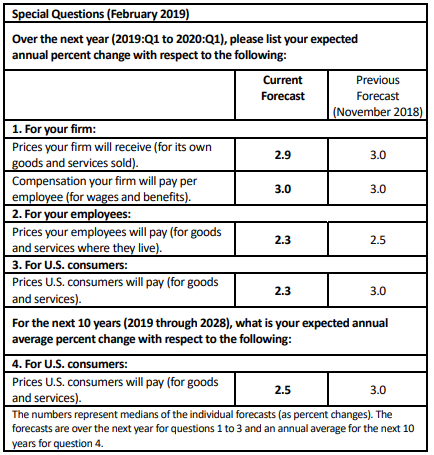 As shown, expectations for growth in prices that firms, employees, and consumers will pay going forward have come down from levels they were at just four months ago.